A collaborative near-future thriller combining history, science, magic, mystery, intrigue, and adventure. When Melisande Stokes, an expert in linguistics and languages, accidently meets military intelligence operator Tristan Lyons in a hallway at Harvard University, it is the beginning of a chain of events that will alter their lives and human history itself. Clocking in at over 700 pages, the book is entirely composed of correspondence: letters, chat logs and redacted government documents. This unusual format allows the authors to create distinct voices for endearing characters, defining them without getting bogged down in backstory, and making more room to explore relationships and describe, in painstaking detail, the 'science' of magic and time travel. Better yet, Melisande trades one bureaucracy for another to prescient and hilarious effect. There’s a lot going on here — stylistic flourishes, comedic pratfalls, romance and science — but it’s handled deftly. Those familiar with Stephenson will recognize his humor and ideas, while Galland brings a fresh and irresistible voice to this ambitious novel. 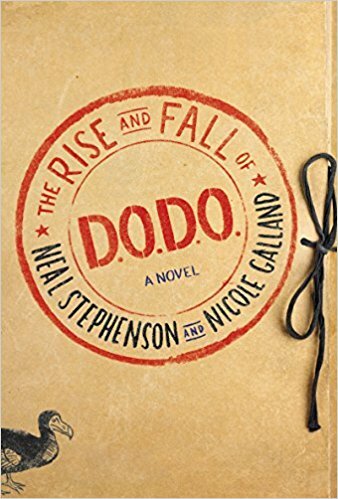 Neal Stephenson and Nicole Galland devise a premise that feels both familiar and fresh, mixing magic and science to pleasurable effect ... Stephenson has many sterling qualities — a playful sense of humor, a willingness to tackle big subjects with accuracy and rigor, a facility with thriller plots that contain well-hidden surprises. These traits are all on display in The Rise and Fall of D.O.D.O. He and Galland work so smoothly in tandem that the seams of their collaboration don’t show ... a high-stakes techno-farce with brains and heart, likely to be enjoyed by anyone willing to lift its more than 700 pages. Luckily, the first 500 pages (!) are smart, hilarious, and bewitching enough to make up for a disappointing final third ... The sprawling cast is one of the book’s strongest points, especially the witches. Erzebet and her fellow witch, Grainne, are easily the two best characters in the book, playing off of common tropes of witches without ever falling slave to them. Stephenson and Galland don’t waste the time-travel premise, either, dropping in on pre-Fourth Crusade Constantinople, Elizabethan London, and many more ... Sadly, the fresh and fun ingenuity begin to wane as the novel grinds to a deus ex machina conclusion. The protagonists become uncharacteristically passive, and threads of plot, both large and small, are left unresolved or completely unaddressed ... a brave novel that defies genre and incorporates many of the best characteristics of both its contributing authors. What did you think of The Rise and Fall of D.O.D.O. ?